Most of my childhood summers were spent an hour North of Syracuse, right on the beach of Lake Ontario. The closest towns were a 15 minute drive to Sandy Creek or the longer 1/2 hour ride in to the booming metropolis of Pulaski. I still make it back there once a summer with my kids and was disappointed to find one of town's establishments had been taken over by a new owner and my favorite sign gone. It was a drop off place for can and bottle returns. For as long as I can remember, an ancient wooden sign hung outside, with the simple words Redemption Center. Driving by I would think to myself " So THAT is where one goes for forgiveness and finds redemption. Ahh if it were only that easy... " Well, Judy's Bottle Return is now sporting it's new name on a brand new sign. The redemption center and it's magical redeeming possibilities now, is forever lost to me. But my brother drew my attention to another new place. 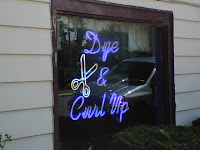 A hair salon called Dye and Curl Up. I think they made the right call by switching the order around. Curl Up and Dye might have been a little too off putting, though both versions leave me with the impression that an appointment should not be made lightly. They could have really gone for the whole kit and caboodle and named it Get Cut, Curl Up and Dye. But that would be just silly.